Ammon Edward Bundy (born September 1, 1975) is an American car fleet manager who led the 2016 occupation of the Malheur National Wildlife Refuge. He is the son of rancher Cliven Bundy, who was the central figure of the 2014 Bundy standoff regarding unpaid grazing fees on federally-owned public land. Bundy was born in 1975 in Nevada, the son of Cliven Bundy, and his first wife, Jane Marie Brown Bundy. He resided in Phoenix, Arizona before moving to Idaho. Bundy owns a truck repair company and was listed as a member of several Arizona companies. Prior to the Occupation of the Malheur National Wildlife Refuge, he had lost a home in a short sale and was behind on his property taxes. Bundy has a wife, Lisa, as well as three daughters and three sons. He also has 46 nieces and nephews. They own a 5,102 square feet (474 m2) home in Emmett, Idaho. On January 28, 2016, Lisa Bundy reiterated her husband's statements in an audio-recording, urging the remaining militants to follow his wishes and return home to their families. Bundy participated in the 2014 Bundy standoff in Bunkerville, Nevada, in which his father, Cliven Bundy, was the central figure. The Bureau of Land Management (BLM) attempted to confiscate Cliven's cattle for grazing on public land for years without a permit. On April 9, Bundy drove an all-terrain vehicle in front of a BLM truck to block it from leaving. Officers told him to move his ATV, and he refused, yelling and approaching them belligerently. When two officers pointed tasers at him and ordered him to back up, Bundy continued to advance. An officer with a police dog approached to compel him to back away from the officers. Bundy repeatedly kicked the police dog and was tasered moments later. He ripped off the taser wires and advanced toward the officers again, resulting in him being tasered a second time. Bundy acknowledged in an interview that he had also climbed on a dump truck that he believed contained his father's cattle. On or before April 10, Bundy asked the Oath Keepers to request that their volunteers who came to the protest follow certain rules. He asked that they not wear military camouflage and to leave their rifles in their vehicles rather than open carry them. He also asked that they check in with him when they arrived at the protest rally point. In addition, he asked that they not drive past the rally point to the Bundy ranch. Furthermore, he asked that no protester give a media interview, instead referring the media to Bundy family members, in particular him, his father, or one of his brothers. On April 10, Cliven and Ammon were interviewed on air by Fox News' Greta Van Susteren. Cliven said he would only accept a court order from a Nevada state court, since he believed that a federal court does not have competent jurisdiction. To that, Ammon added, "If someone came in, busted into my house and abused my children, and so I call the cops, they don't respond, and then I take them to court. I show up at the courtroom, look on the stand, and it's the very person that abused my children looking down at me in a black robe. How in the world are we going to get justice in that court?" On the morning of April 12, the BLM had corralled about 400 of Cliven's cattle. Ammon and a group of protesters went to the makeshift impoundment site and formed a line across it. BLM agents called for backup, but were outnumbered, with about 400 protesters compared to the 50 officers present at the scene. The officers ordered the crowd to disperse over loudspeaker, but they would not. Instead, gunmen started to gather, causing the officers to retreat. On April 14, Ammon, along with Cliven and his brother Ryan, were interviewed on air by Fox News' Sean Hannity. Ammon said, "I'd [participate in the standoff] again, and after it was all over, I couldn't have felt better." Asked about remarks from Senator Harry Reid that the situation was not over, despite the BLM's withdrawal from the standoff, Ammon responded, "Well, if he doesn't have enough moral fiber in his bones at all to see what happened, that 'We the People' got together and made something right, then I don't think there’s any hope for him, and he needs to be kicked out of office, even if he is the Senate majority leader, it doesn’t matter." 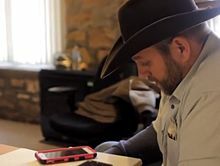 On February 7, 2016, Ammon Bundy—along with his father Cliven, brother Ryan, and others—were indicted in the U.S. District Court for the District of Nevada for their roles in the 2014 Bundy standoff. The men were charged with 16 felony counts: one count of "conspiracy to commit an offense against the United States"; one count of "conspiracy to impede or injure a federal officer"; four counts of "using and carrying a firearm in relation to a crime of violence"; two counts of "assault on a federal officer"; two counts of "threatening a federal law enforcement officer"; three counts of "obstruction of the due administration of justice"; two counts of "interference with interstate commerce by extortion"; and one count of "interstate travel in aid of extortion." This prosecution is separate from the Malheur Refuge occupation prosecution in the U.S. District Court for the District of Oregon. In early April 2016, Judge Brown of the Oregonian prosecution approved an order to send the four defendants charged in both cases, including Ammon and Ryan Bundy, to Nevada to make an appearance in court there. The men were transported to Las Vegas by U.S. Marshals, and on April 16, 2016, Ammon Bundy and the four other militants refused to enter pleas in regards to their roles in the standoff, prompting U.S. Magistrate Judge George Foley, Jr. to enter not guilty pleas on their behalf. In the unusually long arraignment, Bundy asked for the 64-page indictment to be read aloud in court. The trial for the Bundy standoff case was set for February 2017 in Nevada. On December 20, 2017, Federal judge Gloria Navarro declared a mistrial in the Bundy case, citing gross misconduct by the federal government. In her ruling, Judge Navarro stated, "The court does regrettably believe a mistrial in this case is the most suitable and only remedy...." The primary example related to a claim made by defendant Ryan Bundy, who claimed that there were snipers around the property, and that they called for backup only because they felt threatened and isolated. The federal government denied this. Later in the trial, a witness confirmed the presence of a federal videotape, proving that snipers were in fact on the property. This, along with 5 other pieces of evidence, would have greatly affected the trial. Judge Navarro ruled that "the government falsely represented the camera that was on the Bundy house was incidental, not purposeful." She stated that the D.A. 's office knew of this evidence, but would not acknowledge it. This, she decided, violated due process. On January 8, 2018, Judge Gloria Navarro declared the mistrial to be with prejudice, effectively dismissing the charges, on the grounds that the defendants could not receive a fair trial. "The court finds that the universal sense of justice has been violated," the judge told the Los Angeles Times. In 2015, ranchers Dwight and Steve Hammond were resentenced to five years for two counts of arson on federal land, after their original sentence was vacated by the United States Court of Appeals for the Ninth Circuit. By late 2015, the Hammond case had attracted the attention of Ammon and (his brother) Ryan Bundy. Although the ranchers rejected Bundy's assistance, Bundy decided to lead an armed occupation of the headquarters area of the Malheur National Wildlife Refuge on January 2, 2016. He referred to his group as the Citizens for Constitutional Freedom and remarked that it could be a lengthy stay. Bundy speaking to an FBI negotiator via speaker phone on January 21. Bundy's father Cliven said that he was not involved in the occupation, and that it was "not exactly what I thought should happen". Early in the standoff, a Twitter user claiming to be Ammon Bundy tweeted a statement comparing the group to civil rights activist Rosa Parks. The account was later found to be a hoax. Despite this, other involved militants have made comparisons with Parks. Speaking through his lawyer Mike Arnold the day after his arrest (see below), Bundy urged those remaining at the refuge to "please stand down" and go home. Bundy was peacefully arrested on January 26, 2016, when the vehicle he was traveling in was pulled over by a joint force of FBI agents and troopers from Oregon State Patrol. He was with other militants from the occupation attempting to drive to John Day, Oregon for a public meeting where he was scheduled to speak. Another vehicle in the convoy fled the traffic stop until it encountered a roadblock, where Oregon State Patrol officers shot and killed LaVoy Finicum. On January 29, Bundy appeared before U.S. Magistrate Judge Stacie F. Beckerman alongside several other jailed militants. He explained the motives of the occupation to the court, saying that his "only goal from the beginning was to protect freedom for the people." However, Judge Beckerman denied him and the other militants release from jail, explaining that she would not release them as long as the occupation continued. That same day, Bundy offered to plead guilty to the federal conspiracy charge alone, in exchange for the dismissal of the other charges against him, the dismissal of all of the charges filed against the other militants in custody at the time, and letting militants still at the refuge to leave peacefully without arrest. However, federal prosecutors rejected the offer. Bundy later repeatedly urged the militants remaining at the refuge to stand down and go home. In a March 3 interview, Bundy described his life in jail and continued to explain his motives of the occupation. Although he did not witness Finicum's death, Bundy also asserted Finicum had been cooperating with officers before they shot him. On March 8, the federal grand jury in Oregon returned a new, superseding indictment that unsealed the following day, charging Bundy and 25 co-defendants with a variety of crimes in relation to the occupation. Bundy was charged with a total of three offenses: conspiracy to impede officers of the United States by force, intimidation, or threats; possession of firearms and dangerous weapons in federal facilities; and using and carrying firearms in relation to a crime of violence. The latter offense carries a possible life sentence. Bundy's attorney, Mike Arnold of Eugene, Oregon, was accused of organizing a social media harassment campaign against the public agencies involved in evidence gathering and prosecution of the case, and in particular the Oregon State Police. The Southern Poverty Law Center reported that sovereign citizen movement members also attempted to insert themselves into the case, filing a flurry of paperwork in a tactic common to the movement known as paper terrorism. Arnold also faced ethics complaints regarding attempts to unduly influence the potential jury pool and for possible ethical violations involving visits by Arnold's law firm to Bundy and other militants prior to their arrests, offering legal services. The complaint was later dropped by the Oregon State Bar on the basis that there was no sufficient basis to refer the lawyers to disciplinary counsel. On May 9, Bundy's legal team filed new court papers stating that he believed the occupation would result in a civil court taking up the constitutionality of the U.S. government's federal land management policy. The papers also said that Bundy did not expect the militants to be indicted and arrested on federal charges in criminal court. As a result, he began urging the court to dismiss the indictments against the militants, citing his legal team's defense strategy. His lawyers also explained Bundy's beliefs that two U.S. Supreme Court cases addressing his defense strategy "were wrongly decided and should be overruled": a 1935 ruling that the government has had ownership over the refuge's wetlands and lake-beds since the 1840s; and a following ruling that the country's laws have sole control over the disposition of title to its lands, and that the states have no power to establish limitations or restrictions over that control. Bundy countered the rulings with Article 1, Section 8 of the U.S. Constitution, which limits the federal government's powers to acquire and own property, and the fact that no federal court has addressed the question of whether the government can hold "the majority of the land within a state." These motions were rejected by U.S. District Judge Anna J. Brown, citing longstanding Supreme Court precedent establishing the federal government's power to own and manage public land under the Property Clause as being "without limitations," and ruled that Bundy was "mistaken" in his belief that the existence of the wildlife refuge is unconstitutional. On May 26, Bundy filed a "substitution of counsel" document, removing the Arnold Law Firm from the case and hiring J. Morgan Philpot as his lawyer. On June 7, a pro hac vice special admission request was filed in the U.S. District Court for the District of Oregon to allow Utah attorney Marcus Mumford to assist Bundy. On June 10, Judge Brown dismissed one of two firearms charges against Bundy and seven other militants, finding that the underlying conspiracy charge does not meet the legal definition of a "crime of violence" as defined by Ninth Circuit case law. On June 30, Bundy's defense team filed a motion asking for a delay for their client's September 7 Oregon trial, explaining they needed more time to prepare. In the motion, the defense team argued that several pretrial motions were not resolved and Bundy's continued detention in jail "has rendered it virtually impossible for him to participate meaningfully in his defense." The lawyers also asked the court to "allow Bundy another two months to argue for his release pending trial and to help prepare his defense to challenge the federal charges". On July 6, Judge Brown denied this request for a delay in trial. On August 2, Bundy made plans to appeal two federal court orders to keep him in custody pending trial. His lawyer informed the U.S. District Court of Oregon that he would file an emergency motion to postpone the trial unless they examine his client's appeal. In September 2016, Ammon and Ryan Bundy (through Ammon's lawyers, Philpot and Marcus Mumford), filed a motion seeking to permit his client to wear "cowboy" attire in court. The U.S. Marshals Service's policy barred the defendants from wearing ties, boots, and belts, for safety reasons. Denying the motion on grounds that this policy is rational and that the Bundys did not show their attire would prejudice their case, Judge Brown said Ammon was "dressed better than most people in the building, period." On October 27, 2016, a jury acquitted seven of the defendants. Five of them were released but Ammon Bundy and his brother Ryan remained in federal custody pending trial on charges related to the 2014 Bundy standoff. Jury selection for Bundy's trial began on September 7, 2016. Judge Brown said the case would require an unusually large jury pool. Eleven of 31 potential jurors were excused for a variety of reasons, such as opinions regarding the occupation and also personal hardships. By September 9, 2016, 62 people were identified as potential jurors. Twelve jurors (consisting of eight women and four men) and eight alternates were selected by the end of the day. Opening statements were scheduled for September 13, 2016. Eight other co-defendants in the occupation were also originally set for trial on that September 7, 2016, and a further nine co-defendants were set for trial beginning February 14, 2017. In July 2016, with six weeks before the beginning of the first trial in the case, nine of Bundy's fellow militants pleaded guilty, including three of nine militants who were part of Bundy's "inner circle". Of those three, two were reported to be negotiating "a resolution to a federal indictment in Nevada as well" (see below). By August, the total number of militants pleading guilty had increased to eleven. On October 27, 2016, Ammon Bundy was found not guilty on all counts. 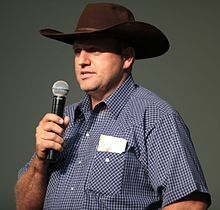 In July 2018 Ammon Bundy at a speaking engagement in Smithfield, Utah claimed that the Church of Jesus Christ of Latter-day Saints, also commonly referred to as Mormons, is currently infiltrated by socialists, globalists and environmentalists. He said this same group of environmentalists, educated in “government” schools, have infiltrated the lower and middle levels of the LDS Church. When asked if LDS church members can trust local religious leaders. Bundy stated that it is up to the individual to determine if these leaders can be trusted. Bundy also claimed that the federal government’s prosecution of him and his supporters following confrontations in Nevada and Oregon is really a “battle of high priests” of the LDS church. He said his father, himself and his attorney are all high priests in the church. But so are the lead U.S. attorney prosecuting his family, the chief judge in Oregon and former Nevada Sen. Harry Reid. At the time of Bundy's standoff with federal officials the Church of Jesus Christ of Latter-day Saints issued a statement critical of the actions of those occupying the Malheur Refuge. The statement said, "this armed occupation can in no way be justified on a scriptural basis." Bundy has publicly claimed to be an active and devout member of the Church of Jesus Christ of Latter-day Saints. In December 2018, Bundy disavowed the militia movement due to his lack of support for President Donald Trump's immigration policy, specifically regarding the Central American migrant caravan. He said, "To group them all up like, frankly, our president has done — you know, trying to speak respectfully — but he has basically called them all criminals and said they’re not coming in here. What about individuals, those who have come for reasons of need for their families, you know, the fathers and mothers and children that come here and were willing to go through the process to apply for asylum so they can come into this country and benefit from not having to be oppressed continually?" Bundy also claimed that nationalism does not equal patriotism and compared the modern-day United States to 1930s Nazi Germany. ^ Siemaszko, Corky (January 4, 2016). "Meet Ammon and Ryan Bundy, the Activists Leading the Oregon Standoff". NBC News. Retrieved January 5, 2016. ^ a b "United States District Court for the District of Oregon". Retrieved January 29, 2016. ^ Ellis, Ralph; Yan, Holly; Sidner, Sara (January 11, 2016). "Leader of armed protesters in Oregon took out $530,000 federal loan". CNN. Retrieved January 11, 2016. ^ "Booking Information for Ammon Bundy". Multnomah County Sheriff's Office. January 27, 2016. Retrieved January 28, 2016. ^ a b c The Oregonian Staff (January 22, 2016). "Faces of the Malheur occupation: Meet the militants and their visitors". The Oregonian (OregonLive.com). Retrieved January 23, 2016. ^ Nagourney, Adam (April 24, 2014). "A Defiant Rancher Savors the Audience That Rallied to His Side". The New York Times. Retrieved January 22, 2016. 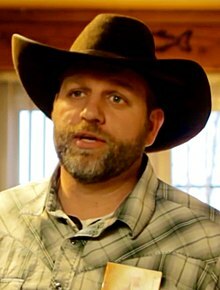 ^ "Indictment Details Charges Against Ammon Bundy, Other Militants". National Public Radio. February 4, 2016. Retrieved July 15, 2016. ^ Brosseau, Carli (January 5, 2016). "Who are the Oregon wildlife refuge occupiers?". Oregon Live. Retrieved April 19, 2016. ^ a b Bernstein, Maxine (March 3, 2016). "Ammon Bundy says jail 'most difficult thing I've ever done'". The Oregonian/OregonLive. Retrieved March 12, 2016. ^ Fuller, Jaime; Blake, Aaron (April 14, 2014). "The long fight between the Bundys and the federal government, from 1989 to today". The Washington Post. Washington, D.C. Retrieved January 23, 2016. ^ "Ammon Bundy owns house in Emmett". Idaho Press-Tribune. January 6, 2016. Retrieved January 31, 2016. ^ Bernstein, Maxine (January 28, 2016). "Ammon Bundy's wife makes a recorded plea, telling those at Malheur refuge to go home". Oregon Live. Retrieved January 29, 2016. ^ a b Gorman, Ryan; Miller, Dan; Keneally, Meghan; Jerreat, Jessica (April 2014). "Federal agents back down in stand-off with armed cowboys". Daily Mail. Retrieved September 4, 2016. ^ Botkin, Ben; Brean, Henry (April 9, 2014). "Militias 'mobilizing' to support embattled Clark County rancher in clash with federal rangers". Las Vegas Review-Journal. Retrieved September 4, 2016. ^ "Stun gun used on Nev. rancher's son in cattle roundup". Reno Gazetta-Journal. April 10, 2014. Retrieved September 4, 2016. ^ "Oath Keepers to help with Bundy protest". Sipsey Street Irregulars. April 10, 2014. Retrieved September 4, 2016. ^ Terry, Don (April 11, 2014). "Not Every 'Patriot' is Rushing to Nevada Standoff". Southern Poverty Law Center. Retrieved September 4, 2016. ^ "Right-Wing Media Eagerly Promote Cliven Bundy and His Anti-Federal Faceoff". Southern Poverty Law Center. April 11, 2014. Retrieved September 4, 2016. ^ Levin, Sam (August 29, 2016). "Rebel cowboys: how the Bundy family sparked a new battle for the American west". The Guardian. Retrieved September 4, 2016. ^ "'We the People Have Spoken': Bundy Family Responds to Nevada Standoff Over Grazing Fees". Fox News. April 14, 2014. Retrieved September 8, 2016. ^ Haas, Ryan; Wilson, Conrad (February 17, 2016). "Bundy Family, Supporters Face 16 Federal Felonies For 2014 Standoff". Retrieved March 12, 2016. ^ a b c Wilson, Conrad (April 6, 2016). "Malheur Refuge Occupiers' Trial Date Set For Sept. 7". Oregon Public Broadcasting. Retrieved April 18, 2016. ^ Uria, Daniel (April 16, 2016). "Ammon Bundy, others refuse to enter pleas in 2014 Nevada standoff". United Press International. Retrieved April 16, 2016. ^ a b "Bundy brothers, three others refuse to enter pleas in Bunkerville standoff". Las Vegas Review-Journal. April 15, 2016. Retrieved April 15, 2016. ^ "Nevada trial for Cliven Bundy, 18 others set for 2017". Oregon Live. Associated Press. April 27, 2016. Retrieved April 27, 2016. ^ "Why Cliven Bundy Is Free". Esquire. 2018-01-08. Retrieved 2018-01-16. ^ Friedersdorf, Conor (5 January 2016). "Oregon and the Injustice of Mandatory Minimums". The Atlantic. Retrieved 4 February 2016. ^ Stack, Liam (January 2, 2016). "Militiamen Occupy Oregon Wildlife Refuge in Protest of Ranchers' Prison Terms". The New York Times. Retrieved January 3, 2016. ^ Wilson, Jason (January 3, 2016). "Oregon militia threatens showdown with US agents at wildlife refuge". The Guardian. Retrieved January 3, 2016. ^ Raymond, Laurel (January 6, 2016). "How A Racist Troll Pretended To Be Ammon Bundy On Twitter And Punked Most Of The Media". ThinkProgress. Retrieved January 10, 2016. ^ Yardley, William (January 16, 2016). "Two weeks in, the Oregon refuge standoff is stuck 'in limbo'". Los Angeles Times. Retrieved January 17, 2016. ^ a b "Ammon Bundy Tells Supporters to 'Go Home and Hug Your Families'". NBC Los Angeles. January 27, 2016. Retrieved January 27, 2016. ^ Terry, Lynne (January 27, 2016). "Inside the John Day meeting where Oregon standoff leaders were headed before arrest". The Oregonian (OregonLive.com). Retrieved September 11, 2016. ^ Johnson, Alex; Blankstein, Andrew (January 26, 2016). "Oregon Occupation Leaders Ammon and Ryan Bundy Arrested, One Dead". NBC News. Retrieved January 26, 2016. ^ Woolington, Rebecca (January 26, 2016). "Pete Santilli: Militants supporter says Ammon Bundy in custody". The Oregonian (OregonLive.com). Retrieved January 26, 2016. ^ KATU.com Staff (January 26, 2016). "Leader of Oregon occupation Ammon Bundy, at least 8 others detained". KATU News: On Your Side. Retrieved January 26, 2016. ^ Zaitz, Les (January 26, 2016). "Oregon standoff spokesman Robert 'LaVoy' Finicum killed, Bundys in custody after gunfight near Burns". Oregon Live. Retrieved January 26, 2016. ^ Bernstein, Maxine (January 29, 2016). "Judge won't release Oregon standoff defendants as long as refuge occupation continues". The Oregonian/OregonLive. Retrieved January 29, 2016. ^ "Feds keep Bundy, militia in jail until trial". KOIN. Associated Press. January 29, 2016. Retrieved January 29, 2016. ^ Ellis, Ralph; Sidner, Sara; Castillo, Mariano (January 29, 2016). "Oregon standoff suspects denied bond". CNN. Retrieved January 29, 2016. ^ Bernstein, Maxine (April 27, 2016). "Ammon Bundy offered to plead guilty to federal conspiracy after arrest, lawyer says". The Oregonian/OregonLive. Retrieved May 1, 2016. ^ Azar, Kellee (February 1, 2016). "Bundy repeats call for occupiers to leave; reports that power, internet are out at refuge". KATU. Retrieved February 1, 2016. ^ Bernstein, Maxine (July 25, 2016). "Ammon Bundy's lawyer wants to inspect grand jury selection records to challenge indictment". The Oregonian/OregonLive. Retrieved July 25, 2016. ^ Bernstein, Maxine (March 9, 2016). "New six-count indictment unsealed in Malheur refuge occupation case". The Oregonian/OregonLive. Retrieved March 9, 2016. ^ Bernstein, Maxine (March 9, 2016). "New six-count indictment unsealed in Malheur refuge occupation case". The Oregonian. Retrieved March 11, 2016. ^ "United States v. Ammon Bundy et al. superseding indictment" (PDF). United States District Court, District of Oregon. July 3, 2016. Retrieved July 3, 2016. ^ "New charges added for Bundys, other militia". KOIN News. March 9, 2016. Retrieved March 12, 2016. ^ "Ammon Bundy, Others Face Weapons Charge With Possibility of Life Sentence". Talking Points Memo. Associated Press. March 10, 2016. Retrieved March 12, 2016. ^ Bernstein, Maxine (April 26, 2016). "More state bar complaints filed against Ammon Bundy's lawyer, critical of social media crowdsourcing". The Oregonian/OregonLive. Retrieved April 29, 2016. ^ Conrad Wilson (April 26, 2016). "More Ethics Complaints Filed Against Ammon Bundy's Attorney". Oregon Public Broadcasting. ^ Morlin, Bill (April 7, 2016). "Federal Judge Blocks Sovereign-Styled 'Lawyers' From Oregon Occupation Case". Southern Poverty Law Center. Retrieved April 29, 2016. ^ Moran, Jack (February 26, 2016). "District attorney files Oregon State Bar complaint against Eugene lawyers representing Ammon Bundy". The Register-Guard. Retrieved April 29, 2016. ^ Bernstein, Maxine (February 8, 2016). "Ammon Bundy's lawyers deny breaking legal ethics rule with refuge visit". The Oregonian/OregonLive. Retrieved April 29, 2016. ^ Bernstein, Maxine (May 3, 2016). "Oregon Bar drops complaint against Ammon Bundy's lawyers tied to refuge visit". The Oregonian/OregonLive. Retrieved May 12, 2016. ^ a b Bernstein, Maxine (May 9, 2016). "Ammon Bundy had intended refuge occupation to end up in civil court, lawyers say". The Oregonian/OregonLive. Retrieved May 12, 2016. ^ "Defendant Ammon Bundy's Motion to Dismiss for Lack of Subject Matter Jurisdiction" (PDF). United States District Court, District of Oregon. May 9, 2016. Retrieved May 12, 2016. ^ "295 U.S. 1 - United States v. State of Oregon". Open Jurist. 1935. Retrieved May 12, 2016. ^ "United States v. Oregon 295 U.S. 1 (1935)". Justia. 1935. Retrieved May 12, 2016. ^ Ryan, Jack (July 3, 2016). "United States v. Ammon Bundy et al. Order Resolving Round One Motions on the Pleadings". United States District Court, District of Oregon. Retrieved July 3, 2016. ^ Bernstein, Maxine (May 26, 2016). "Ammon Bundy retains new lawyer, former Utah State Rep. J. Morgan Philpot from Molalla". Retrieved May 27, 2016. ^ "Ammon Bundy Hires New Lawyer". Associated Press. May 27, 2016. Retrieved May 27, 2016. ^ Savage, Peggy (June 9, 2016). "Molalla native hired as Ammon Bundy's lawyer". Portland Tribune. Portland, OR: Pamplin Media Group. Retrieved July 14, 2016. ^ Gehrke, Robert (June 7, 2016). "Ammon Bundy adds another Utah attorney to his defense team". The Salt Lake Tribune. Salt Lake City, UT. ISSN 0746-3502. Retrieved July 14, 2016. ^ Bernstein, Maxine (June 10, 2016). "Judge Dismisses One of the Gun Charges Against 7 Defendants". The Oregonian/OregonLive. Retrieved June 10, 2016. ^ "Order Granting Motion (#465) to Dismiss and Dismissing Count Three of the Superseding Indictment" (PDF). The Oregonian/OregonLive. United States District Court for the District of Oregon. June 10, 2016. Retrieved June 10, 2016. ^ Bernstein, Maxine (July 1, 2016). "Ammon Bundy seeks delay in September trial, asks for pretrial release". The Oregonian/OregonLive. Retrieved July 3, 2016. ^ "Defendant Ammon Bundy's Motion to Continue September 7, 2016 Trial Date" (PDF). United States District Court for the District of Oregon. June 30, 2016. Retrieved July 3, 2016. ^ Bernstein, Maxine (July 7, 2016) [1st pub. July 6, 2016]. "Federal judge denies Bundy brothers' requests for delay in trial". The Oregonian/OregonLive.com. ISSN 8750-1317. Retrieved July 8, 2016. ^ Templeton, Amelia (July 6, 2016). "Judge Will Not Delay Refuge Occupation Trial". Portland, OR: Oregon Public Broadcasting. Retrieved July 8, 2016. ^ Brown, Karina (July 6, 2016). "Courtroom Cleared After Bundy Riles Gallery". Pasadena, CA. Courthouse News Service. Retrieved July 8, 2016. ^ "United States of America v. Ammon Bundy Notice of Appeal" (PDF). United States District Court, District of Oregon. August 2, 2016. Retrieved August 13, 2016. ^ Bernstein, Maxine (August 2, 2016). "Ammon Bundy to appeal his detention, again seek delay in Sept. 7 trial". Oregon Live. Retrieved August 13, 2016. ^ "Order Denying Defendant Ammon Bundy's Request RE: Trial Attire". September 9, 2016. Retrieved September 12, 2016. ^ Bernstein, Maxine (September 7, 2016). "Ammon Bundy's lawyer argues for his client's right to wear cowboy boots at trial". The Oregonian/OregonLive. Retrieved September 11, 2016. ^ Bernstein, Maxine (September 7, 2016). "Federal judge finds Bundy brothers' trial attire appropriate". The Oregonian. Retrieved September 11, 2016. ^ "Oregon wildlife refuge occupiers cleared". BBC News. October 27, 2016. Retrieved October 27, 2016. ^ Bernstein, Maxine (September 7, 2016). "Judge excludes 11 of 31 potential jurors for Oregon standoff trial in first day of questioning". Oregon Live. Retrieved September 9, 2016. ^ Bernstein, Maxine (September 9, 2016). "Jury expected to be selected in Oregon standoff trial by end of day". Oregon Live. Retrieved September 9, 2016. ^ Bernstein, Maxine (September 9, 2016). "Jury selected for Oregon standoff trial; opening statements begin Tuesday". Oregon Live. Retrieved September 9, 2016. ^ Bernstein, Maxine (July 23, 2016). "Oregon standoff: 9 guilty pleas up ante for Ammon Bundy, 16 others". The Oregonian/OregonLive. Retrieved July 23, 2016. ^ Press, KATU.com Staff and Associated. "Jury finds all 7 wildlife refuge occupiers including Ammon Bundy not guilty on all counts". KATU. Retrieved 2018-01-16. ^ CNN, Steve Almasy. "Ammon Bundy, 6 others acquitted in Oregon standoff trial". ^ Sottile, Leah (December 7, 2018). "Ammon Bundy spoke kindly about the migrant caravan. The backlash has him reevaluating his supporters". Washington Post. Retrieved 9 December 2018.